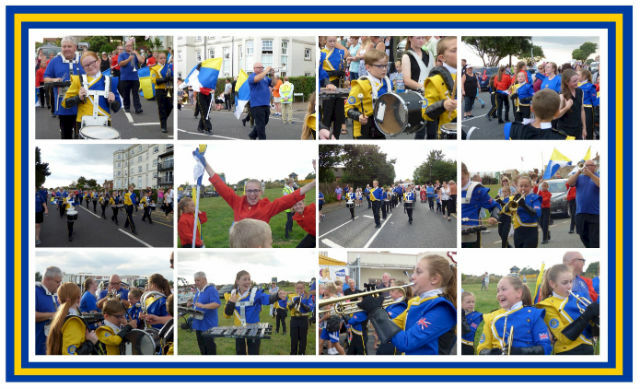 Thurrock Marching Brass entertained a packed 2016 Clacton Carnival on Saturday 13 August 2016 as people lined the sea front route under perfect blue skies. This is an annual trip to the seaside for the young marching band who really enjoy taking part in this popular carnival. Despite having a large number of members on their holidays, the band did a fantastic job, with clap along tunes and drum cadences along the route. This is also an opportunity to let some of the staff members join the band which was wonderful to see and to hear and also great fun too. Speaking of the day, Corps Director, Jay Lindner comments “It’s absolutely brilliant that we are able to entertain the public in this way and I would like to extend our sincere thanks to everyone at the Clacton Carnival committee for including us. The whole band, including the staff members who also joined in, enjoyed the experience. The whole atmosphere was exactly as it should be – fun, light hearted with just the right pinch of professionalism to ensure that everyone enjoyed not only the band’s performance, but the day itself. As a special conclusion to the day, once out of uniforms, everyone was treated to a well-earned McDonalds once which added more fun. I’m really proud of all the staff, members and supporters that help to make the day such a fun and enjoyable one”. Posted by News Editor on Friday, September 2nd, 2016. Filed under British Youth Band Association, FrontPage Feature.